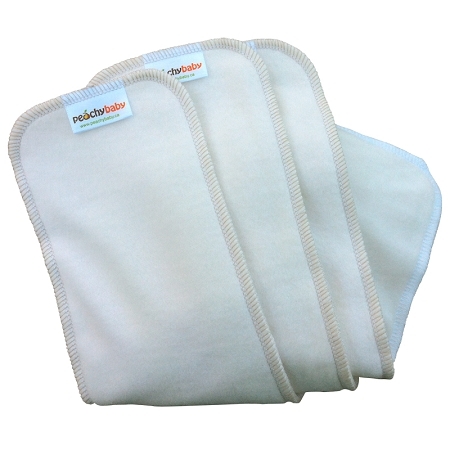 The Peachy Baby inserts are made of three layers of soft and super absorbent 70% rayon derived from bamboo and 30% organic cotton fleece. For newborns use one small insert or a large insert folded down for a little more absorbency. For older babies use two inserts for a trim super absorbent diaper. For SUPER heavy wetting babies or toddlers you can use 3 inserts (this is an amazing night-time solution!). Totally customizable for a great fit at every stage!